'Dull Margaret' review: jerky people in a jerk world make for powerful, telling art – AiPT! She is trying to break your heart (and maybe steal some body parts). In 2016, writer Donald Hall penned a heart-wrenching essay about life at 87. One line in particular proved extra effective in dropkicking your mortal soul: “Now and then, especially at night, solitude loses its soft power and loneliness takes over. I am grateful when solitude returns.” In one line, Hall strikes at the notion that solitude has a certain dignity attached, and loneliness is what takes over when we somehow lose that sense of control and assuredness. 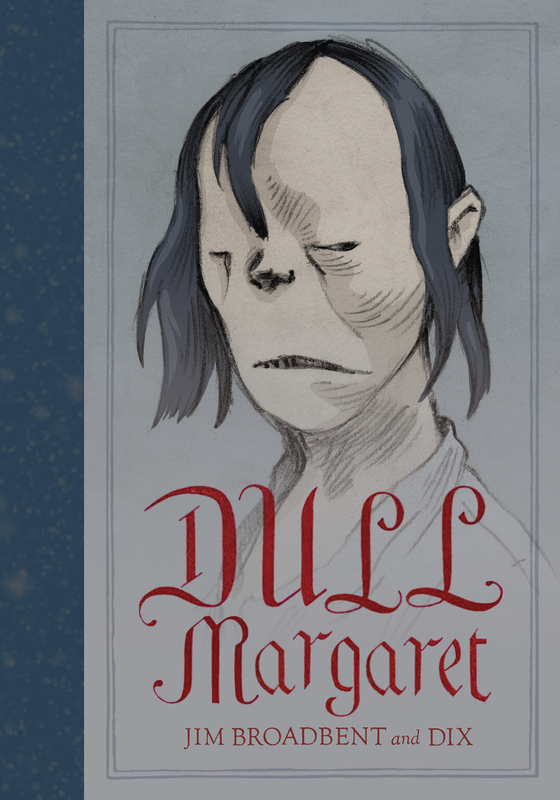 Hall passed away recently, and I got to revisit that essay as I tackled Dull Margaret, the debut graphic novel from actor Jim Broadbent (AKA, Horace Slughorn from Harry Potter and Archmaester Ebrose from Game of Thrones). The book exists very much in the vein of Hall’s notions of solitude and loneliness, tracing what happens when a person crosses over from being alone to struggling endlessly with feelings of isolation. Whereas Hall has a certain grace regarding his solitude (which isn’t to say he didn’t suffer), Broadbent weaves a tale of a character who uses loneliness as a weapon in a bizarre, undeniably dark tale of revenge. Despite any connections (perceived or otherwise), it’s not Hall from which Broadbent draws inspiration. Rather, the whole story of Margaret begins with “Dull Gret,” a 16th century painting by Pieter Bruegel the Elder. For his own artwork, Dix (who draws the Guardian‘s “Roll Up! Roll Up!” strip) expertly strikes at the painting’s terrifying balancing between the otherworldly and the uncannily realistic. It’s a dichotomy that plays out in the bleak English shoreline, the character’s mutant rat faces, and even the way the lines of text practically undulate. The titular Margaret is especially haunting – somewhere between a ghoul and a mound of burnt clay. Yet all of that ugliness and filth is somehow inviting. It can feel rather cartoonish in a way, a product meant to entertain with exaggeration (while also turning you off human interactions for a time). Even as you stare into these un-human faces, still thinking about jagged teeth and the wiggling of slimy eels, it’s hard to still not feel somewhat connected and engaged. The whole experience is like finding a dead bird as a child: you want to look away, but can’t help but poke it with a stick. Dix’s art is a master class in blurring the lines of reality and basic decency, and it’s quite effective at maintaining a steady sense of momentum between gross/scary high-points. As stomach-churning as the art is (see page 106! ), it all feels like the appetizer for the story itself. Given Broadbent’s experience as a character actor, it’s no wonder that he’s done a brilliant job in creating the singularly disturbing Margaret. More than even her melted pumpkin face, it’s her very soul that’s rotten. On the one hand, she’s utterly alone, cast violently aside from her village. Yet while that sets her up to be a sympathetic character, it’s her behavior that sheds much-needed light on her leper status. She mumbles to herself, engages in the blackest of magic, and ultimately tries to use ancient powers not to improve herself, but for her own greedy aims. Even when she makes a “friend,” she treats him like junk and calls him Worm. Margaret is the story’s antagonist and protagonist wrapped into one un-charming mold. You feel for her plight just as much as you hate her for, say, mutilating dead bodies and abusing a poor mute fella. There’s real heartache attached as you recognize the depths of her pursuits for power and gold and good old fashioned vengeance. You may also find yourself celebrating and then shaking your head in disappointment (at both yourself and in general) at the somewhat nebulous ending. But that’s what makes Margaret so compelling — she’s a powerful encapsulation of humanity. Victim and villain, the tragic results of someone’s own foolish choices and meddling. We all get in our own way, and with this tome, Broadbent shows the tragic outcomes of a species who blindly and happily steps on its own toes. In a way, Margaret’s reflective of the painting that inspired her. The “Dull Gret” portrays Dulle Griet pillaging Hell itself with an army of heroic women. Sure, it’s Hell they’re ransacking, but the piece creates this certain disconnect. There’s a beauty and order to the landscape (even with spider-pig-man hybrids and man-eating fish), and even as these brave woman come marching in, you can’t help but feel something’s off. These women may, in fact, be the invaders — who are they to impose order on a world which seems to be functioning just fine? It’s quite the same for the land of Dull Margaret: decency and order and power are all fluid ideas. Not only is it up to the consumer to understand and impose structure, but no idea or end result is wrong given your perspective. The world and people are just as broken, and how you put the pieces back together (through art and culture) speaks depths while offering minimal comfort. I got to thinking about just what sort of lessons this graphic novel might provide. One might glean insights about greed, friendship, and even a lil’ Confucian wisdom. But I turn again to another piece of Hall’s writing (this from The Old Life): “We learned how to love each other/by loving together/good things wholly outside each other.” Press for Dull Margaret describes it as a “damaged soul navigating an unsparing world,” and those two quotes together highlight an essential element. The path to finding happiness or completion is through people, but in a way that finds all of us loving and striving toward life’s bigger pillars. Like decency and love and compassion and basic understanding. The only way to get through the world in something resembling one piece is to hold onto things outside our tiny grasp. Watching Margaret struggle to do so, failing to connect with humanity by removing herself from that very humanity, is both a deeply entertaining tale and a lesson worth clinging to dearly. Terrifying, effective art that'll crawl in your head. A powerful lead character brimming with nuance and emotion. A tale of loneliness and power that doesn't feel so direct and linear. You may hurl from watching wriggling eels?